I'm happy to post some of the cards we made in Canada this past weekend. This is a close up of one of the 3-D Pop up cards we made in a clear dome; notice the new glitter swirl peel offs! And I just love this new die, Anja's Roses Centerpiece, that was used to make the "window" in this sample. There is also a matching Anja's Roses Corner die! Here, we used this new beautiful shimmery card stock and the rose flower punch and embosser set. We used 2 different size punches, even though there are 3 sizes available. Notice the beautiful embellishment inside the flower! It is so elegant and simply made with a silver spacer and a mini glitter brad. I am sure you are going to love these! I'm thrilled that the goodies have arrived from Canada today! I'm going through the order and getting it out on the shelves for you! Join us on Saturday, May 19 for the big Show & Tell and see these and more up close and personal. (The pictures unfortunately do not do them justice.) 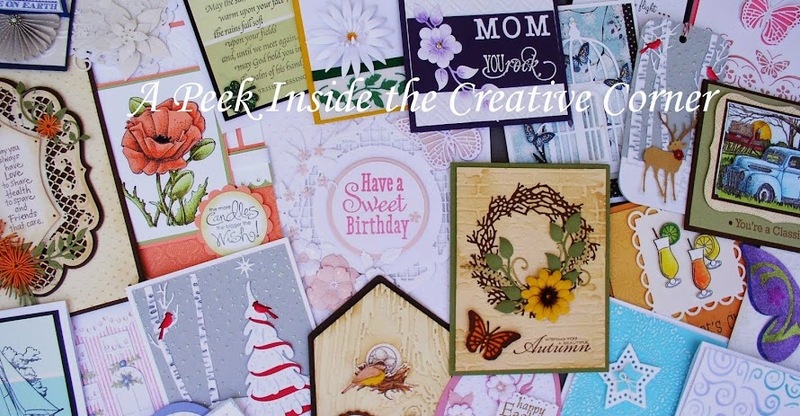 In addition, we will have a Make & Take and give away the new Nellie Snellen Catalog to the first 10 customers of the day!